Thanksgiving break was our chance to rest, but the music world was insanely active. In the spirit of the gift-giving holidays right around the corner, a generous amount new projects were released. Lil Wayne, Rick Ross, Fabolous, Erykah Badu, Kendrick Lamar, J. Cole, Chris Brown, and Trey Songz were all in the spirit of the season. On Thanksgiving day itself, Lil Wayne, Rick Ross and Fabolous vamped up their extensive collections by dropping brand new mixtapes, starting off the avalanche of new releases. Lil Wayne gave us No Ceilings 2, the highly anticipated followup to his 2009 mixtape No Ceilings. He remixed some of the biggest tracks right now, adding his signature Weezy style to “Milly Rock,” Future’s “Where Ya At,” and “Jumpman,” off of ‘What A Time To Be Alive’ and more. And of course, he included a remix of Drake’s “Hotline Bling,” a trend many artists couldn’t resist. While Fabolous may have the season wrong with his new mixtape Summertime Shootout, he’s definitely got his timing right. He has a tradition of dropping mixtapes on holidays as he released The Soul Tape II,The Soul Tape III, and The Young O.G. Project on major holidays. And to no one’s surprise, his new album The Young O.G. Project 2 will be dropping Christmas of this year. This tape featured artists like Nicki Minaj, Trey Songz, and Bryson Tiller. Fabolous got in on the “Hotline” fun as well with his remix, “Trapline Bling” featuring Josh K.
Surprisingly, Erykah Badu was able to craft one of the most creative variations of the upbeat song. On Black Friday, Badu gave us her new mixtape, while both Kendrick Lamar and J. Cole released two new tracks, and Chris Brown dropping a new mixtape. Erykah Badu’s cover of Drake’s hotline bling, “Cel U Lar Device” built the foundation for her mixtape, But You Caint Use My Phone. 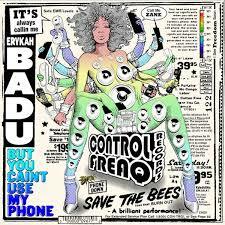 The track propelled her to create an entire phone- inspired project including references to her song “Tyrone.” The mixtape Badu described as “TRap&B” was released on Black Friday; her first release since New Amerykah Part Two: Return of the Ankh in 2010. Kendrick maintained his signature style and still managed to match his delivery with the energy of Cole’s original track. While he made a seamless, cohesive connection to the sound, Cole took a different approach. His verse delivery revealed a raw, aggressive energy as opposed to his normal easy-going, often melodic, style. He also drops a major hint about a project with Kendrick Lamar at the end of the track responding to a fan yelling, “When you and k dot s*** drop?” spitting back “But this February bet s*** get scary when I f*** around and drop-” and the track ends in a prolonged bleep sound. So be on the lookout this February for further collaboration between these two. Chris Brown was in a particularly giving mood as he surprised us with 34 new tracks on his mixtape “Before the Party” with dope album artwork. He featured a plentiful guest list on the project, including Rihanna, Wiz Khalifa, Tyga, Fetty Wap, and Kelly Rowland. Unlike many of the recent mixtape releases, this one has a almost exclusively original work. It’s a hearty appetizer for his upcoming album Royalty dropping December 18. This past weekend definitely gave us a lot to be thankful for.